Configure DSE for Kerberos. 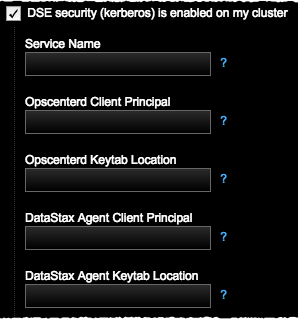 For more information, see Authenticating a cluster with Kerberos in the DataStax Enterprise Documentation and review the Kerberos tutorial. Create an opscenterd principal and register it with DataStax Enterprise. To view the users who are on the node, run the list users command in cqlsh. Create service principals for the OpsCenter agent user running on each node and register them with DataStax Enterprise. The default user name is cassandra. Note: If you require running the agent as a different user than cassandra, see setting permissions to run the agent as a different user. Create keytabs for the cassandra principals and move them to the location of the datastax-agent directory on each node. Place the keytabs in the location configured for your environment. The default location is /usr/share/datastax-agent/krb5.keytab for package installations, or install_location/datastax-agent/krb5.keytab for tarball installations. The path to the keytabs is configurable using either the [kerberos] opscenterd_keytab_location in cluster_name.conf, or the DataStax Agent configuration options (address.yaml) in address.yaml. Change the owner of the keytabs and the /datastax-agent directory to the cassandra user. The following example changes ownership of the /datastax-agent directory and keytabs for the default location in a package installation. Replace the paths below with your configured keytab location as appropriate for your installation type. When adding the cluster as described in adding an existing cluster, select DSE security (kerberos) is enabled on my cluster. Enter the information as applicable to your environment.